Fall is in the air – I’ve gone from sleeveless tops to long sleeve t-shirts for our daily morning walks with the girls. 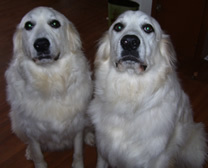 And for those of you that don’t know who the girls are, that Hattie and Lacey our two Great Pyrenees. On the Coffee/Tea Chats, Dr. Chess, urges us to take time and care of ourselves, so that we can go about doing the work of networks. Since instituting the daily early morning walks with the girls, I will have to admit that it has helped me in many ways – it gets me up and moving and helps me log 15-20 minutes of walking every day; fresh air and beautiful scenery is a great way to start the day; and love the great company – my husband and dogs! One of the biggest joys each morning is watching Hattie (left) and Lacey (right) express their excitement as they run through the house for the front door to get their leashes on to go for a walk! I hope all your board members react that way when it comes to their involvement in your network! NCHN’s network organizations are only as strong as the leadership – and you are the leader! If you do not have a routine in place to take care of yourself, then I encourage you to develop one, make it a habit, and share with us what you are doing, along with some photos for the website. I think all of the regular participants on the Coffee/Tea Chats have a mental image of one member that is always moving during the chat! Speaking of taking time for yourself and taking care of yourself, if you have not considered attending the 2012 NCHN Leadership Summit next month, this would be a great place to begin taking care of yourself! The Leadership Summit will be the one place where you can meet with your peers and colleagues from across the country and feel at ease discussing your most pressing leadership challenge and/or sharing your best leadership strategy. There is still time, barely, to get your room reservation at the special NCHN rate – and register for the Summit. The 2012 Leadership Summit Committee has prepared an outstanding event. Details are included within this newsletter and are also posted on the NCHN website. Which NCHN Member Network has 5 member organizations and specializes in Community Health, Grant Writing, Publiv Health, Adolescent Health and Wellness, and School and Community-Based Health Services? Its mission to "to develop the infrastructure and capacity to integrate and enchance school-based and community-based efforts to improve the health and well-being of adolescents." Encouragement to those of you that have not completed your profile on the new NCHN website. If you haven’t visited the site, please take a few minutes to explore the resources available to you as a Network Leader. One of the new components of the site is the network profile section. This is an excellent networking tool to help you better connect with your colleagues. The formatting and editing of the submissions received to the call for “Best Practice Models/Success Stories/Lessons Learned are underway and will soon be available for viewing on both the NCHN website and the RAC (Rural Assistance Center) website. Watch for details on how to access these learning tools in a September Weekly Digest. Second Orientation Call – Thursday, September 6 – details are included in this newsletter. September Coffee/Tea Chat – Wednesday, September 12 – looking forward to a great discussion about the responsibilities of your network boards and how you go about setting goals for the board and tracking their progress. The 2012 Network Leader and Salary Survey Report was recently released. Thanks so much to the 36 NCHN members that participated in the survey. We are in the process of administration of the survey to non-NCHN members. If you have network s within your state that are not currently members of NCHN, but that you think would be interested in participating in this survey, please let us know. Plans are underway for the second National Rural Health Day, scheduled for Thursday, November 15. Watch for suggestions for activities and programs that your network may want to offer or participate in to become a part of this national celebration of rural health. The event is coordinated by our partner, NOSORH (National Organization of State Offices of Rural Health). In other news this month, we are so happy to welcome a new member, Virginia Telehealth Network and Edie Bowles as the Network Leader. We look forward to working with Edie again and welcome VTN to NCHN! I hope to see you in Kansas City for the 2012 NCHN Leadership Summit in September! Mary Kay Chess is faculty at Bainbridge Graduate Institute, an MBA program in the NW and at Saybrook University. She teaches system thinking and complexity, adaptive change strategies and leadership and personal development in these vibrant learning communities. Dr. Chess also consults with foundations and organizations as well as their boards on building the leadership capacity necessary for thriving in our complex world. In addition, she serves as a leadership coach to executives and faculty teaching teams. Many of you know Mary Kay from the NCHN Coffee & Tea chats facilitated by Dr. Chess. She also designs and leads the Association's Leadership Development Program. Mary Kay held executive roles in rural and urban hospitals and healthcare systems including Gundersen Lutheran and Kaiser Permanente as well as in shared services networks of medical groups and hospitals. She delights in bringing perspectives from diverse stakeholders to the table to create innovative options and opportunities. Heman A. Marshall III practices primarily in the areas of health law, general corporate and antitrust. His areas of concentration include, but are not limited to, assisting his clients in the complex area of federal and state regulatory schemes such as Stark II, state and federal anti- kickback laws, Medicare and Medicaid reimbursement issues, managed care negotiations, physician-hospital contracting, joint venture efforts, and antitrust issues. He has served as the Coordinator of the firm's Health Law Practice Section since its inception in the early 1980's, and was the initial Chairman of the Virginia Bar Association Health Law Section upon its founding. He has also served as the Chairman of the Virginia State Bar Health Law Section and the Virginia State Bar Antitrust, Franchise and Trade Regulations Section, and is currently a member of the Governing Counsel of the Virginia Bar Association Health Law Section. Please join the Board in welcoming NCHN's newest member: Edie Bowles, Executive Director of Virginia Telehealth Network. Virginia Telehealth Network (VTN) was founded in 2006. The primary purpose of VTN is to advance the use of telehealth in Virginia in order to increase access to health care for underserved communities. Click on "NCHN Member Handbook" and click "Download Document"
As the business of healthcare constantly evolves, hospitals face a significant challenge: how to provide outstanding patient care while remaining financially viable. Just as all employees and managers (clinical and non-clinical) play a part in the patient experience, their actions and decisions also have financial implications for the organization. What should non-financial people at your hospital understand about how the organization makes money? How do individual actions and decisions impact the financial metrics tracked by senior leadership? How can healthcare workers reconcile excellent patient care with sometimes difficult financial decisions? Healthcare organizations around the country have relied on a classroom-based, team-centered business simulation to help them better understand these issues. The simulation was developed by Paradigm Learning and is called Zodiak. It has been experienced by more than 2-million people and has been adapted to the healthcare industry with great success. Zodiak is fast-paced, fun and energizing. Participants in the simulation learn which numbers are important to their hospital and how actions and decisions impact those numbers. You are invited to a webinar to learn more about how the Zodiak experience can benefit your network. It will be held Friday, September 14 from 1:00 – 2:00 ET. During the first 30-minutes you will see an overview of the simulation and how it’s being used in healthcare. The last 30-mintes will be for questions. To register, email Debbie Comeau at dcomeau@synernet.net by Friday, September 7th. Please provide your name, your network’s name and an approximate number of beds represented by your network. 1. How are preventive dental services delivered to underserved communities and families at a distance? 2. How technology is used to deliver clinical & educational services supported by private-public partnerships? 3. What are current teledentistry programs and practices in development to improve access to dental care? 4. What are developing/potential linkages between teledentistry and telehealth? The National Advisory Committee on Rural Health and Human Services provides advice and recommendations to the Secretary with respect to the delivery, research, development, and administration of health and human services in rural areas. August 23, 2012 (HHS News Release) - Today, Health and Human Services (HHS) Secretary Kathleen Sebelius announced the next steps in the Obama administration’s work to help doctors and hospitals use electronic health records. August 22, 2012 (CMS News Release) - In support of more effective, more affordable, higher quality health care, 500 primary care practices in seven regions have been selected to participate in a new partnership between payers from the Centers for Medicare & Medicaid Services (CMS), state Medicaid agencies, commercial health plans, self-insured businesses, and primary care providers. This partnership is designed to provide improved access to quality health care at lower costs. August 26, 2012 (WORH.org) - The Stage 2 EHR Incentive Program Final Rule, released on August 23rd, provides significant additional flexibility and is a great improvement over what was proposed. It seems to me that CMS and ONC have listened to provider concerns (rural included) and have crafted a regulation that is likely to be reasonably achievable by those rural providers that have already achieved or are close to achieving Stage 1. August 24, 2012 (FierceHealthIT) - The American Hospital Association is urging the Federal Communications Commission to simplify the application and reporting requirements for its Rural Health Care Pilot Program to make it more accessible to small hospitals. Earlier this month, the FCC declared the $415 million broadband pilot, launched in 2006, a success. It said it improved the quality and reduced the cost of delivering healthcare in rural areas through telehealth, increased revenue for rural clinics and hospitals, and allowed exchange of electronic health records and training of rural medical personnel. It since has put out a call for comments about proposed revisions to the program. August 2012 (The Nation's Health) - Jamie Bell, MD, has a job she loves, working with a poor population in a Birmingham, Ala., hospital. Most of her patients have serious, chronic medical conditions. “The healthy ones have diabetes, high blood pressure and high cholesterol,” she said. Many are much sicker. It is a population that badly needs a caring physician, and Bell is able to serve them, despite being nearly $250,000 in debt from medical school, thanks to a program run by the Health Resources and Services Administration. August 24, 2012 (Kaiser Commission on Medicaid and the Uninsured) - This historical review finds that the availability of federal funds has served as an effective incentive for states to provide health coverage to meet the health and long-term care needs of their low-income residents despite state budget pressures. More than half of states implemented a Medicaid program within the first year federal funding became available, and nearly all states were participating in Medicaid within four years. Over time, states have met new federal requirements to extend Medicaid coverage and expanded beyond minimum coverage levels. The brief provides important context for how states may respond as they weigh the costs and benefits of expanding their Medicaid programs in 2014 as called for under the Affordable Care Act. August 24, 2012 (HHS News Release) - Today, Health and Human Services (HHS) Secretary Kathleen Sebelius announced that California, Connecticut, Hawaii, Iowa, Maryland, Nevada, New York, and Vermont have received new grants to help support the establishment of Affordable Insurance Exchanges. Starting in 2014, consumers and small businesses will have access to high-quality, affordable health insurance through an Exchange – a one-stop marketplace where consumers can choose a private health insurance plan that fits their health needs and have the same kinds of insurance choices as members of Congress.